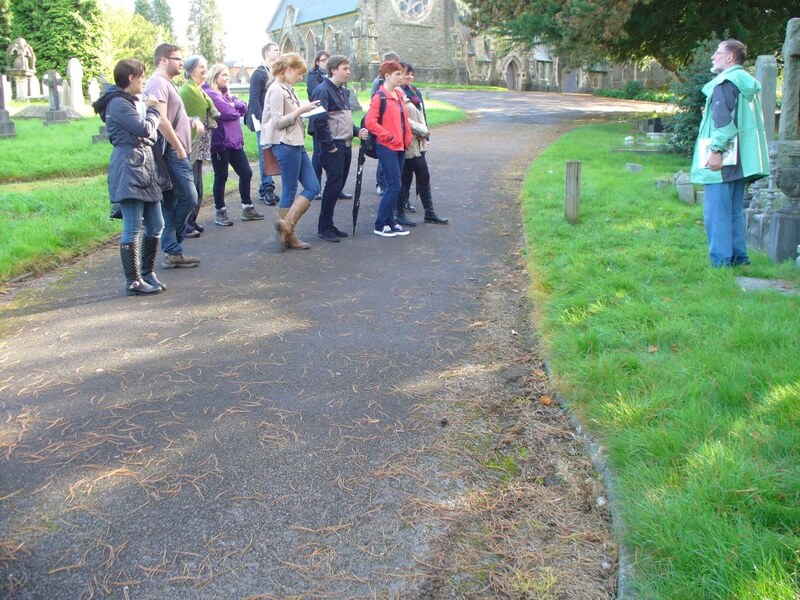 I take my Art & Death group to Cathays every year (it’s my idea of a day off because Steve actually does the leading). Here we are listening to him (all the photos are Andrew Brown’s). Cathays Cemetery was Wales’s first out-of-town municipal cemetery. When it was established in 1859, London had its ‘Magnificent Seven’ cemeteries on the edge of the built-up area and Glasgow had its Necropolis, but many urban burials were still taking place in graveyards like the ‘tiny churchyard, pestiferous and obscene’ in which Lady Dedlock’s late lover was buried in Dickens’s Bleak House. Nor was Cathays Cemetery only for the dead. 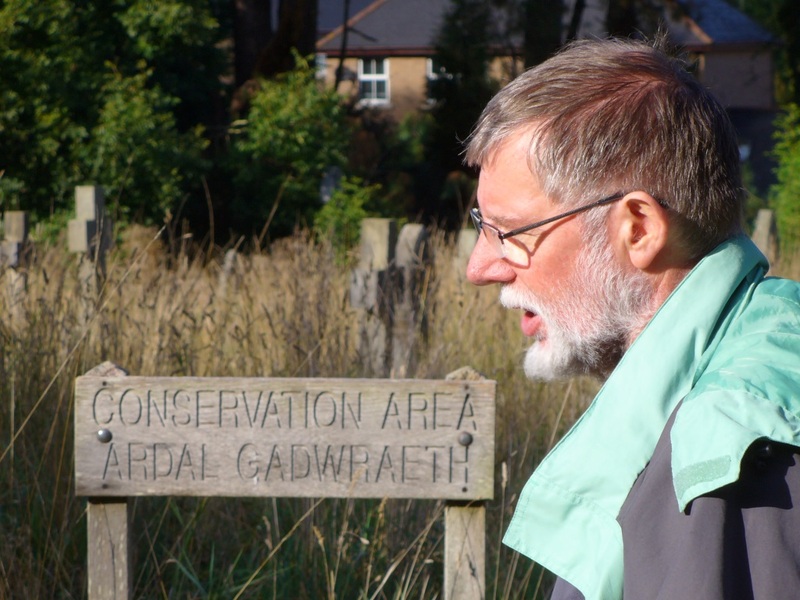 Laid out as an arboretum with a wide range of trees and shrubs, the graves deliberately adorned with examples of sculpture and religious symbolism, it was a place for working-class self-education as well as fresh air and exercise, part of Cardiff’s network of ‘green lungs’. 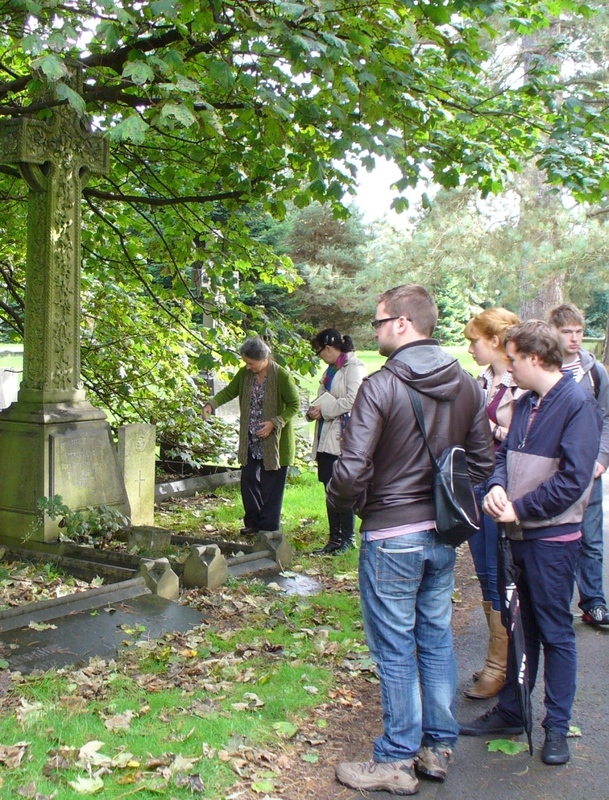 Here we are debating the memorial to Solomon Andrews, entrepreneur and (possibly) philanthropist. He established Cardiff’s leading tram company and built the Central Market. In his will he left money to provide everyone who came to his funeral with a suit or a coat. Of course, they came in their thousands – and all those who wanted one got a coat. We argued long and hard whether this was generosity or showiness. My own feeling is that it’s both – and that there is a lot to be said for conspicuous consumption that also benefits others. You get the same debate with medieval wills. All that money to the poor, in return for their prayers – of course, it was geared to a simple calculation of what would get your soul out of Purgatory. But at the same time, there is something refreshing about a society that actually values the prayers of the poor and thinks they have a hotline to God, just because they are poor and a bit smelly. A bit of selfish philanthropy might have been handy during the Irish potato famine (not really a famine – there was plenty of food in Ireland but it was being exported, mainly to landlords in England). Here we are at the memorial to the victims of the ‘famine’ (better termed the Starvation). It’s in four languages – Irish Gaelic, the Latin of their Catholic church, English (so those who were responsible can read it) and Welsh (to commemorate the very reluctant hospitality the Welsh gave the boat people of the nineteenth century, those who fled the famine). It is set in the heart of the Catholic section of the cemetery. 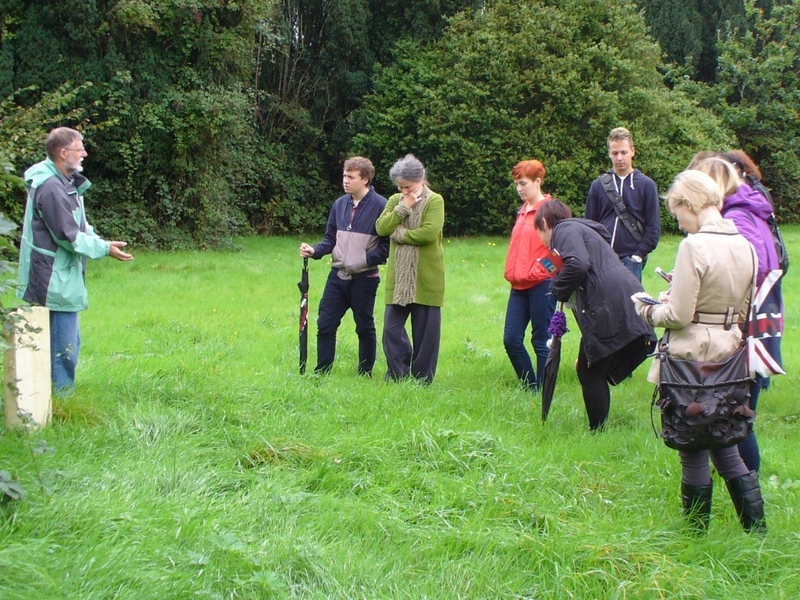 Cathays was originally laid out with separate areas for Catholic, Anglican and Protestant Nonconformist burials. You can still see the Anglican and Nonconformist chapel near the entrance (in the background of the first photograph). There was a Catholic chapel, rather hidden inside the cemetery (which tells you a lot of what you need to know about Welsh attitudes to the Catholic church in the nineteenth century) but it was demolished because it had become derelict. 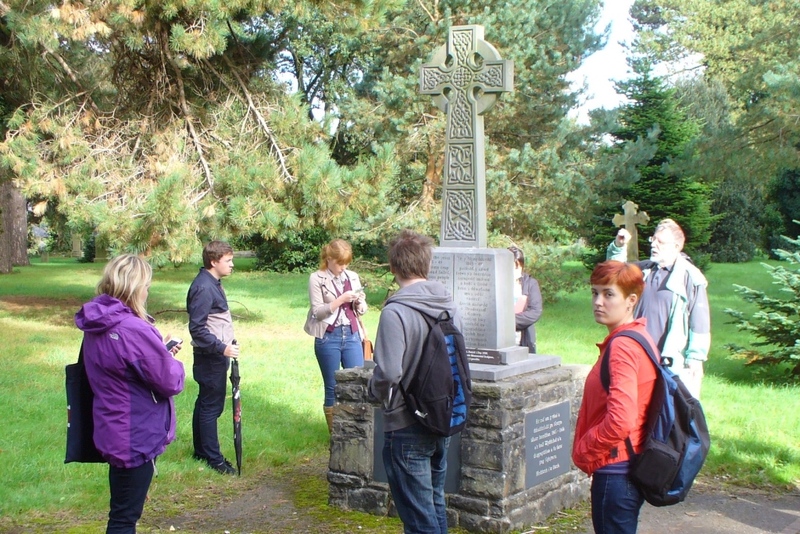 The whole area round where the chapel was is a history in stone of Cardiff’s Irish Catholic community. You can see them becoming prosperous and more confident in their beliefs (it must have helped when Cardiff’s most powerful landowner, the massively wealthy Marquess of Bute, became a Catholic) but you can also see the plot in which the nuns of Nazareth House are buried. They came to Cardiff to care for the abjectly poor (really like the nuns who worked with Mother Teresa in Calcutta) and they established hospitals, care homes and the famous Nazareth House orphanage. They were helped by a local athlete, ‘Peerless’ Jim Driscoll. You can also see his memorial in the Catholic section. Steve is particularly interested in the war graves with their distinctive Portland stone and design – here we are looking at one. They are scattered through the cemetery – here is one in the Catholic section – but cared for by the Commonwealth War Graves Commission. So you could be buried with your family or community but still have your military service recognised. Lutyens’ design for the stones is superb – clear, tasteful, identifiable but with room for things like distinctive regimental badges and all the information – but his choice of materials was a disaster (almost as bad as his choice of reinforced concrete to build New Delhi). The stones have to be replaced on a regular basis. I have always wondered what happens to the old ones. Could you just discard them? 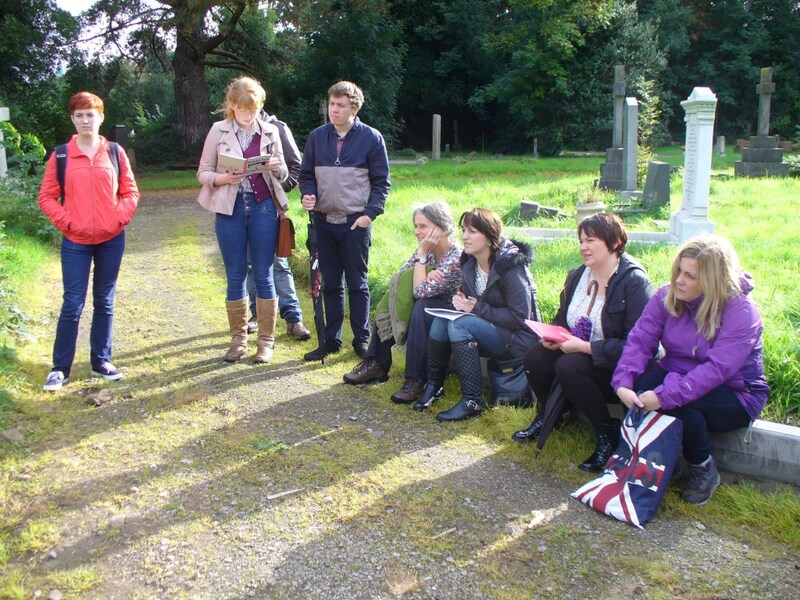 Here we are in pensive mood – I think this is when we were listening to the story of young Louisa Evans, killed in a ballooning accident when she was only 14. Cathays was planned as a public open space, for education as well as exercise – and it still has something of that about it. 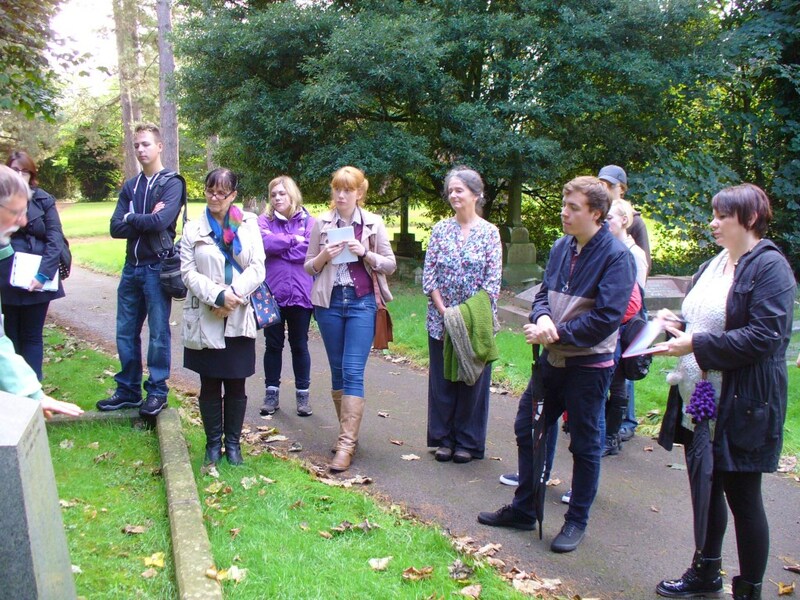 The Friends of the Cemetery organise regular walks, exploring Cardiff’s history and encouraging people to take gentle exercise. Part of the cemetery has been set aside for biodiversity, and the grass and wild flowers are encouraged to grow. Of course, it still has to be managed, or brambles and scrub would take over. We did have a discussion about how families would feel if they came back from far away to visit a grave and found it in what looks like a ‘neglected’ area of the cemetery. Me, I’d like the idea of my grave providing a refuge for dormice and slow-worms but there’s no accounting for tastes. We’ll have a lot of these issues in sharper focus when we visit Thornhill cemetery and crematorium in a few week’s time.